A large sword with a thorny, spiraled blade. Now abandoned and most of it's power lost, it seems that it once dominated foes, but in an area with ancestral spirits or a monolith forest, you may be able to see it's past sky-cutting power. 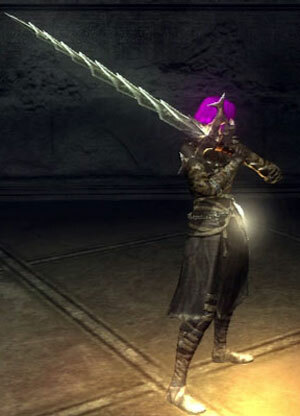 There is only one chance to obtain this sword per play through. When you enter 4-3 to fight the Storm King, turn to your right and follow the path downhill towards where all the Storm Beast are flying. If you bear left before you approach the ruined building you will enter a flat area with rubble of broken monuments. Towards the center there are 2 Crystal Lizards, and to their left, you will see a weapon stuck into the earth. That is the Storm Ruler. If you wish to grab it to fight the boss and enemies here, you will have to evade their attacks as you run to collect it (the Thief's Ring will help), and you will probably startle and scare off the lizards. The Storm Ruler is a unique sword that does not do very high damage and has an extremely low durability, so it breaks easily. It does, however, have a knockdown effect on all horizontal swings that connect. In pvp, this weapon is often times used as a tool to knockdown opponents for performing a follow-up action (e.g. use recovery items, cast spells). It has the lowest durability of any weapon (any item for that matter) in the game. When used in the final boss zone of Shrine of Storms it has a special attack unlocked which allows its attack to split the air with a thunder-crack, giving this melee weapon a vertical ranged attack. It has the lowest stat requirements of any item in the game.